The first King Salmon available to catch from shore should start trickling in to the Homer Spit Lagoon by the middle of May. This run of Kings should build in strength by month’s end. 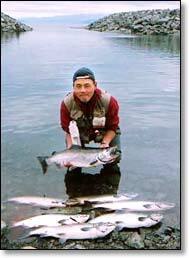 The Kasilof River is open every day with fair numbers of King Salmon starting to show by May 16, when bait is first allowed. Fishing will continue to improve throughout the remainder of May. 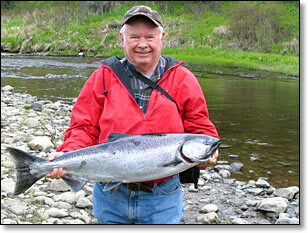 The Anchor River opens on Saturday, May 21 through Monday, May 23 for King Salmon. There should be good numbers of King Salmon already in the river by then. This river will also be open on Wednesday, May 25, and every Wednesday after the weekend openers. Next, the Anchor River, Deep Creek and Ninilchik Rivers all open on Saturday, May 28, of Memorial Day Weekend for three days through Monday May 30, for King Salmon. The Anchor River will also be open onWednesday, June 1. 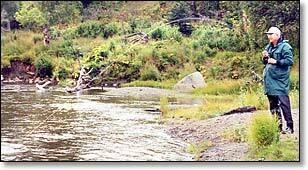 Which rivers provide the best fishing largely depends on the amount of snow melt and recent rains. King Salmon should peak by the first week in June and remain strong until the middle of the month. This can be an extremely enjoyable fishery, especially when hitting the tides right, in the early morning. The Kasilof River King Salmon fishery should peak by June 10, offering good fishing through the third week of June, and fair fishing for the next couple of weeks into July. The Anchor River, Deep Creek and Ninilchik Riversall open for two more long weekends, (June 4-June 6) and (June 11-June 13), with the Anchor River also open on Wednesday, June 8 and Wednesday, June 15. The second weekend in June is generally the peak of the King Salmon run in these rivers! 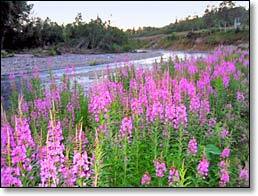 The Anchor River is open for one additional weekend, (June 18-June 20) with its last Wednesday opener on June 22. 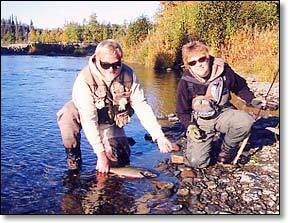 All three rivers should provide great fishing, as various fishing holes are explored. 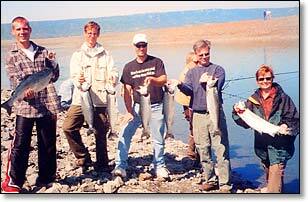 The early run of Silver Salmon should start to show up by the first week of July. By the middle of the month, this fishery should peak, and continue strong through the first week of August. The Kasilof River King Salmon fishery remains open in July, and before the water level rises too high, this river is still a viable option for King Salmon and Dolly Varden Trout. The Anchor River, Deep Creek and Ninilchik Rivers open for fishing again on July 1, and remain open until the first of November. The Ninilchik River is the only one of these three rivers that remains open for the taking of hatchery King Salmon, and the fishing can be very good for the first half of the month! On the other two rivers, regulations prohibit fishing for King Salmon. We use smaller gear and hooks to target after Dolly Varden trout and Pink Salmon, which will begin to migrate into the rivers. Any King Salmon accidentally hooked must be released unharmed in the water. Dolly and Pink Salmon fishing will build by the middle of the month, and will continue to remain strong through most of the month. 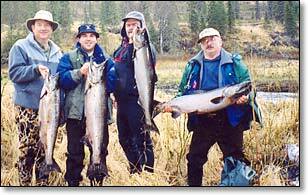 All three rivers offer excellent fishing for Silver Salmon in August. By the middle of this month, Silvers are usually quite abundant and fishing can get pretty wild throughout the rest of August. Also on August 1, the upper portion of these rivers open for Dolly Varden and Steelhead/Rainbow fishing, but remain closed for all salmon fishing. This offers some great new fishing holes to explore, and fishing can be exceptional. The Anchor River, Deep Creek and Ninilchik Rivers will still provide fair Silver Salmon fishing for the first part of September, but only unbaited, single-hook artificial lures are allowed, starting Sept. 1. As the Silvers begin to decrease, the Steelhead will increase throughout the month and should peak by month’s end. 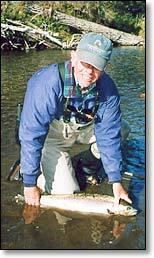 Steelhead fishing is catch and release only, and the fish must be released unharmed in the water. Still, this offers some of the most exciting fishing available. Dolly Varden Trout will still be present in specific stretches of the rivers, and fishing for Dollies and Steelhead will continue through October. Please keep in mind that this fishing outlook is only our best educated guess for what to expect, based on our past experience..